Street Legal Quads. They're Here! A Honda CBR 1100 was the donor for this steet quad project. Street legal quads are about as rare as common sense in government. That's what the owner of Hi-Power Quads found out after several attempts to license a street legal 4 wheeler. Then he stumbled on a way! He happened to have a wrecked Honda CBR 1100 that he planned to rebuild. Checking the rules at the state Department of Motor Vehicles in Texas gave him an idea. So he asks if adding wheels to his rebuilt bike would prevent it from being street legal or qualifying for licensing. 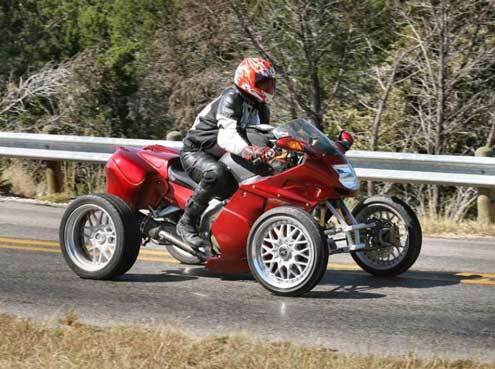 This owner was able to license his bike to quad conversion as a motorcycle. Turns out - No! - it would not! Since it was titled as a street legal motorcycle - that's how the rebuilt bike would also be titled as long as it met standard safety regulations for motorcycles. The end result is what you see here. A licensed, insured, legal-to-ride-in-all-50-states, street quad! Can you say "Adventure Tour"? 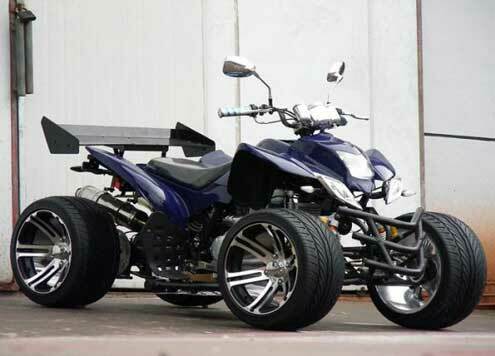 Integrated saddlebags give this street quad some sport touring flair. Seems the big problem with street legal quads is the fact that since most ATVs are intended for strictly off road use - they don't meet DOT rules and aren't issued titles. Same as dirt bikes. 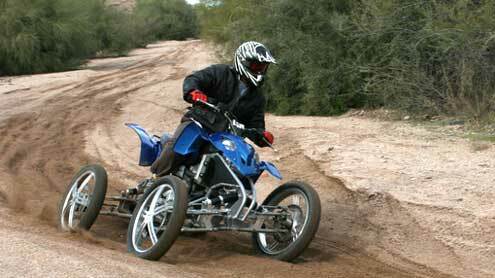 Now some states and municipalities that have high ATV traffic have changed some laws to allow street legal quads. Unfortunately, that doesn't help the rest of us. So maybe we just need to work with the DMVs to recycle some of those street legal motorcycles with titles laying around in salvage yards. Could be that a wrecked Yamaha R6 ends up looking a lot like a 450 Raptor, if you follow me. As long as all the required paperwork looks right - that's all most DMV employees will care about. Or maybe that Yamaha R6 (or whatever?) donates it's parts to a conversion kit that looks something like the one in this picture. (Enterprising fabricators please Contact Me - let's talk!) 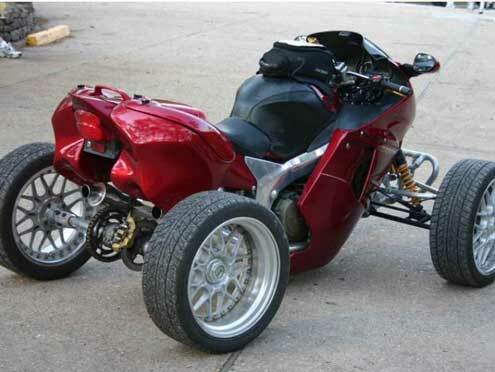 Street legal title with street legal parts - must be a street legal motorcycle - (that just happens to look like a quad!). The Joyner Buggy can possibly be licensed under kit car rules. Here's another take on street legal quads - the buggy. I've seen several of these with license plates but am told that it depends a lot on how strict your state's DMV is. Many owners go the home built or kit car route to getting titles and licensing for the buggies. It can probably be done most places - you just have to use government approved terminology. Tell them "kit car" - not "new Chinese buggy". One of the latest takes is this street legal side by side that began as a Polaris RZR XP1000 and now looks like a VW Baja Bug! Polaris Razor S with a street legal conversion kit. 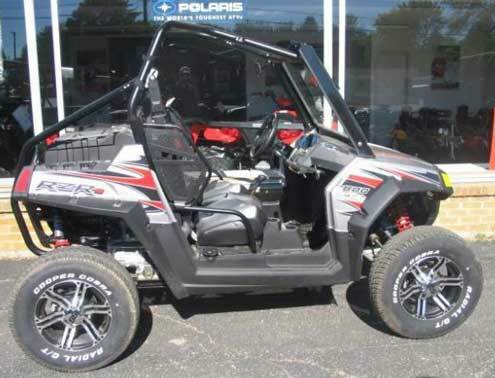 Polaris Razor S with a street legal quad conversion kit. This one is from Michigan where I believe they do allow street legal ATVs in some areas. This one is equipped with lights, horn, turn signals, brake lights, and a full windshield with wiper. Most UTVs and side by sides could possibly slide through under kit car rules like the buggies. Once again - you have to use the right words at the DMV. 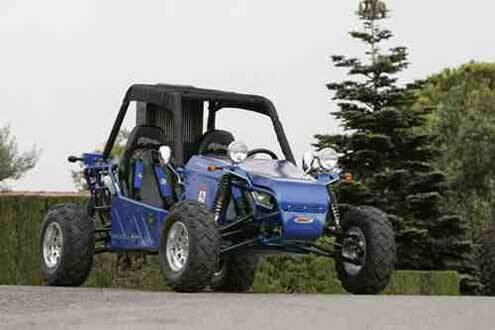 The new electric Polaris Ranger may qualify as a "green" vehicle in some places. That would make it eligible to legally be driven on the street. All most of us really want is a small, light, economical, multi-purpose vehicle that's fun to drive/ride and will go just about anywhere you want to go without a lot of drama. The machines you see here will do that. The only thing holding them back is your friendly government. Cause - you know- they're concerned about your safety. Street legal quads are common in most of the world - of course they don't have enlightened transportation agencies and caring liability lawyers like us. So I say do what you have to - call it what you have to - just do it. Kinda seems like that's how this country got built in the first place! Street Legal 4wheelers - Where are they legal? Plus video and photos. 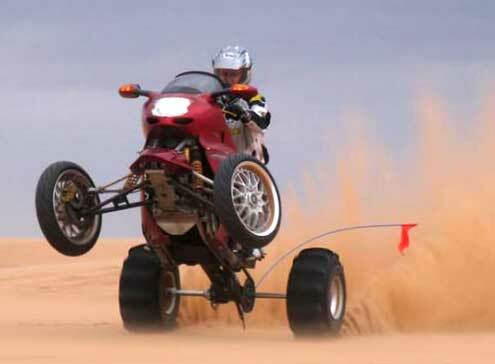 Street Legal ATVs - Report on street ATVs from around the world.